Photo 1: Cooper’s hawk affected with West Nile Virus. The bird seems to be “absent”, do not respond to external stimulation and presents an abnormal position of its tail. West Nile Virus (WNV), from the Flaviviridae family, can infect animals and people through stings from virus carrying mosquitoes. Even if certain species of mammals, such as horses, can be affected by this virus, it mainly causes mortalities in wild birds. West Nile Virus is maintained in wild bird reservoir via the mosquito (especially Culex sp.) transmission cycle. The sensitivity of bird species to this virus is variable; birds from the Corvids family and birds of prey (Falconidae and Strigidae) being especially at sensitive. Since its introduction in the Province of Québec at the beginning of the years 2000, the activity of this virus has varied from one year to the other. After a relatively quiet period from 2004 to 2010, an increase in the numbers of mortalities was documented from 2011 to 2013, whereas mortalities associated with WNV decreased the following years (Figure 1). This summer (2017) we have observed a relatively high level of activity of WNV in wildlife. Indeed, as of September 26, 2017, a total of 79 cases of WNV infections has been documented by the Québec Regional Centre this summer, which represents a record year. 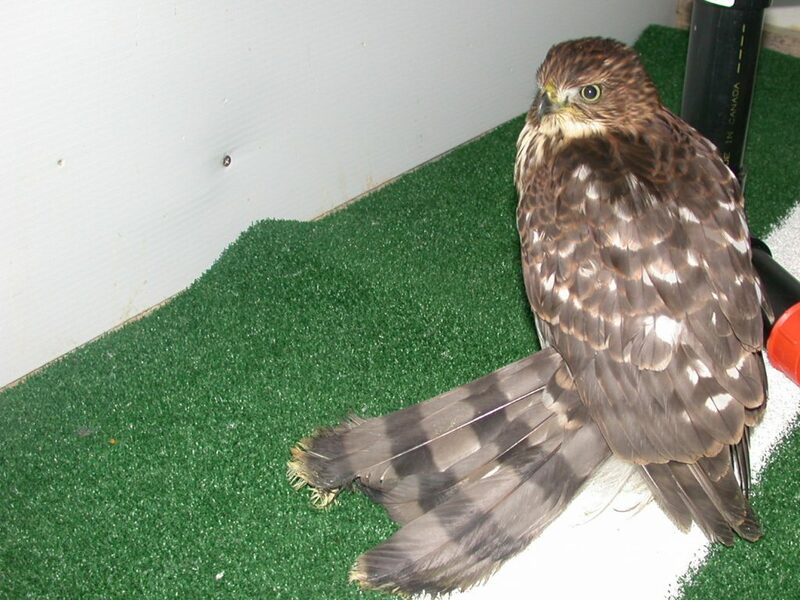 With a few exceptions, cases were diagnosed in birds of prey, especially in Merlin (39 cases), Broad-winged hawk (9 cases), Cooper’s hawk (7 cases) and Sharp-shinned hawk (6 cases). The preponderance of birds of prey documented with this disease is not unexpected due to the relative high sensitivity of this group to WNV and to the fact that birds of prey represent a significant proportion of the animals submitted to our centre for expertise. 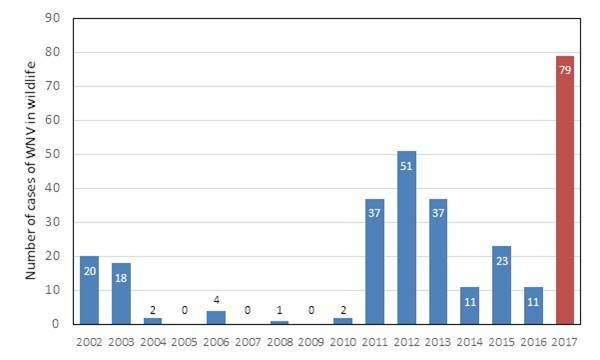 Figure 1: Number of cases of West Nile Virus infections documented in wildlife by the core surveillance program in Québec per year as of September 17, 2017 (Source: CWHC). It is interesting to point out that a fatal case of WNV was diagnosed in an Eastern gray squirrel that was found in St. Hyacinthe with neurological signs. Squirrels are the group of wild mammals most commonly affected by this viral infection in North America. Isolated clinical cases of WNV have also been described in the literature in other species of non-domestic mammals such as seal, wolf, polar bear and macaque. West Nile Virus can also affect people, and even if infections are usually asymptomatic, this virus can cause, in some cases, serious illness (encephalitis). The detection of WNV in sentinel species, such as wild birds, enable to identify incoming risks for the human population. 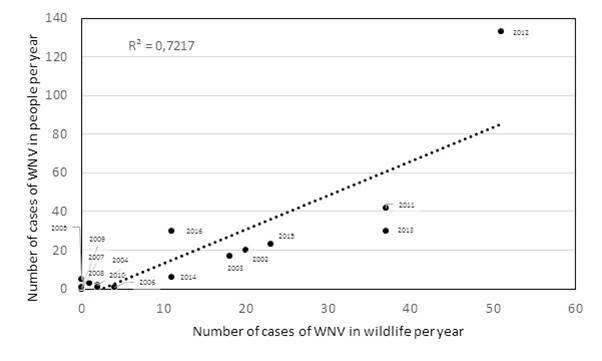 Indeed, over the years we have observed a strong correlation between the numbers of cases of diagnosed WNV in wildlife and cases in people (Figure 2). Usually the first cases of WNV in wildlife in a given region precede the first human cases by a few weeks. Consequently, the documentation of a relatively high number of WNV cases in wildlife this summer should translate by an increase in the incidence of this condition in people in the province. However, this does not seem to be the case, at least for now. Indeed, as of September 25, only 10 cases of serious WNV have been reported in people in the province. If this trend continue, 2017 will end out to be a relatively quiet year for serious WNV infections in people, despite the fact that the high number of WNV positive birds documented suggests high levels of WNV activities. The reason for this lack of correlation in 2017 remains unclear. However, it can be hypothesized that the relatively rainy and cold summer that we had in the province this year has contributed to decrease the time that people spent doing outdoor activities such as gardening and hiking, which could have decrease the potential exposure to infected mosquitoes. Having said that, the mosquito season is not over yet, and with the sunny and warm weather that Québec has experienced the last couple of weeks, we should expect to see more cases WNV in people in the coming weeks. Figure 2: Correlation between the number of cases of West Nile Virus diagnosed in wildlife and the number of cases of serious WNV reported in people in Québec (Sources: CWHC and INSPQ).